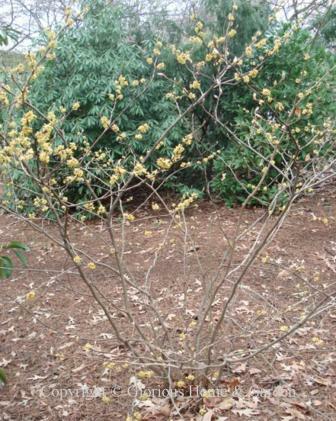 Winter flowering shrubs are a boon to the winter-weary gardener who longs for spring. Carefully chosen and sited (depending on your climate) is is possible to enjoy color and fragrance most months of the year. Camellia japonica, Japanese camellia, Zones 7-9. The most beautiful of the winter flowering shrubs, these queens of the winter/spring garden, depending on cultivar, location and the weather, bloom anywhere from late fall to mid spring in milder parts of the country. C. japonica has larger leaves than C. sasanqua and grows larger overall. Some early season bloomers will sometimes be caught by a late freeze. Colors are white, pale to deep pink, red--even a few yellows--and there are several variegated cultivars. 'Rebel Yell' is pictured. 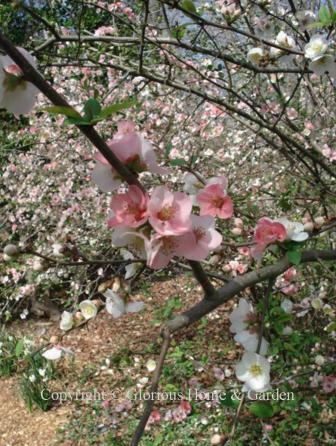 Some of the best places in the country to see camellias are the headquarters of the American Camellia Society at Massee Lane Gardens in Fort Valley, Georgia, Norfolk Botanical Gardens in Norfolk,Virginia, and the Huntington Gardens in Pasadena, California. 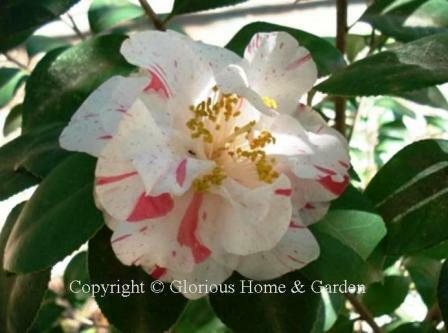 Click here for more information and pictures of favorite cultivars of Camellia japonica. Chaenomeles speciosa, flowering quince, Zones 4-8. Flowering quince stands out in the late winter or early spring garden in mostly rather loud coral, orange or red flowers. There are white and double forms also. To me, the prettiest one is 'Toyo-Nishiki' which has white, soft pink and deep pink blooms on the same plant. It has a softer, more refined look. Plant it where you needs a splash of early color, but where it will be unobtrusive the rest of the year perhaps in a mixed shrub border. 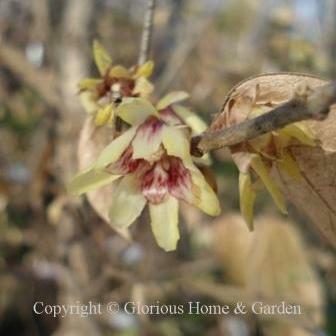 Chimonianthus praecox, fragrant wintersweet, Zones 6-9. I was wandering around the State Botanical Garden in Athens, GA in January and caught a whiff of a delightfully sweet fragrance. I looked around for the source and soon found a deciduous shrub with small waxy yellow flowers with rosy-purple at the base of the interiors . Got to have one! This is an underutilized winter flowering shrub that is lovely in a woodland garden or near the house so you can enjoy the fragrance. Daphne odora, fragrant daphne, Zones 7-9. One of my favorite winter flowering shrubs. When the buds begin to swell in late February on the daphne I grow in a pot by my back door, I know that spring can't be far off. Great for fragrant winter flowers. 'Aureomarginata' is pictured with leaves edged in pale yellow and purple buds which open to white inside. Edgeworthia chrysantha, paperbush, Zones 7-9. 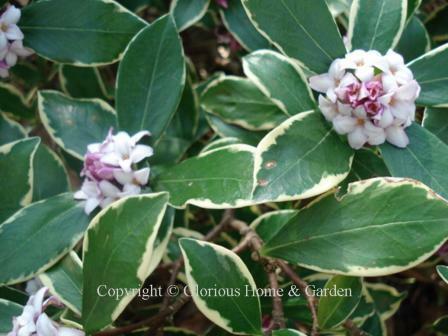 This winter flowering shrub is a novelty, but is striking and a shrub for all seasons. 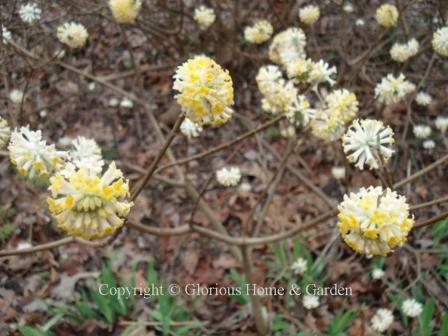 Paperbush stands out in the late winter garden as its large white bud clusters open on the ends of bare stems to reveal yellow flowers that exude a lovely sweet fragrance that can be detected across the garden. The leaves are very handsome also all summer, and turn a lovely soft yellow in the fall. Even before the flowers open, the bare stems, dotted with last year's leaf scars add interest, and terminate with the conspicuous white buds. Erica carnea, winter heath, Zones 5-7. This small evergreen makes a lovely ground cover for northern zones with its winter flowers in colors of white, pink, mauve, purple and red. Eriobotrya japonica, loquat, Zones 8-10. 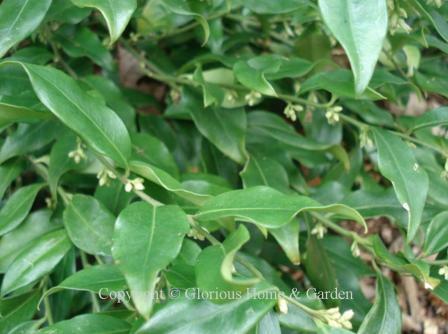 The fruit-bearing evergreen winter flowering shrub, or small tree, is unusual in that it flowers in winter. The flowers are fragrant, and the fruit can be used to make jams or jellies. Garrya elliptica, silk tassel bush, Zones 7-10. 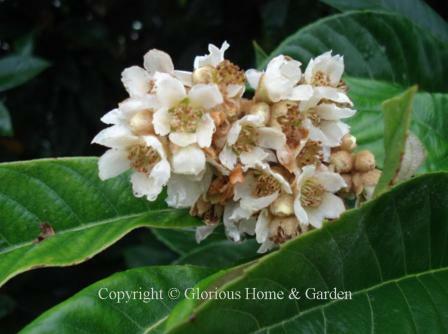 This evergreen flowering shrub is native to the western coasts of California and Oregon. Winter flowers (long pendulous catkins) occur on both male and female plants, but those on male plants, which occur in January and February, are showier. Hamamelis mollis, Chinese witchhazel, Zones 5-8. 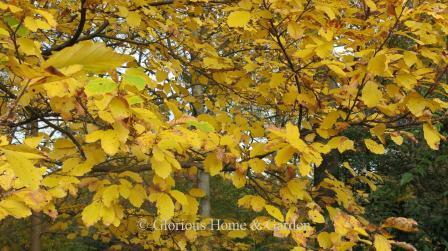 Witchhazels are must-have winter-flowering shrubs. 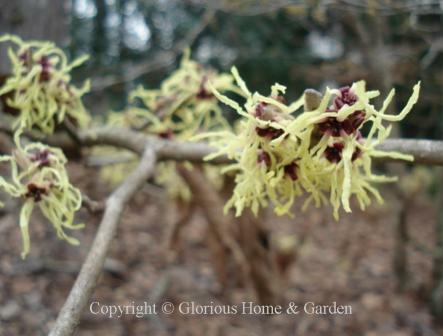 Chinese witchhazel produces fragrant yellow winter flowers on a spreading shrub or small tree. 'Pallida' is pictured. Hamamelis vernalis, vernal witchhazel, Zones 4-8. 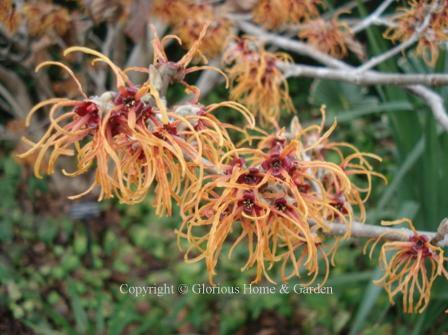 Vernal witchhazel produces long-lasting fragrant yellow, orange or red winter flowers. Good for fall leaf color also. Hamamelis X intermedia, hybrid witchhazels, Zones 5-8. These hybrids are crosses between H. mollis and H. japonica. Some of the best are 'Arnold Promise' with yellow flowers, 'Diane' with orange-red flowers, and 'Jelena' with interesting flowers that graduate from red at the base to yellow at the tips of long, twisted petals. 'Jelena' is pictured. Jasminum nudifolium, winter jasmine, Zones 6-10. Bright yellow flowers pop out of slender green branches at the first hint of warmth. Unfortunately, it is not fragrant, but very welcome nonetheless for a flash of color when everything is brown and gray. Lindera obtusiloba, Japanese spicebush, Zones 6-9. Small greenish-yellow flowers occur in late winter on the bare-stemmed branches followed by red-changing to black-fruits. Grows well in shady conditions and is excellent for brilliant yellow fall leaf color as well. Lonicera fragrantissima, winter honeysuckle, Zones 4-8. Unlike the viney types of honeysuckle, fragrant winter honeysuckle is a winter flowering shrub that resembles a snowstorm when in full bloom. The individual flowers are tiny, but en masse they pack a fragrant punch in late winter. Nice for a screen or hedge especially against a darker background where they can stand out. This is one of those shrubs, like forsythia, that look much better and more graceful with their natural arching branches rather than pruned in stiff formal shapes. They can be pruned back severely after flowering to rejuvenate when necessary. 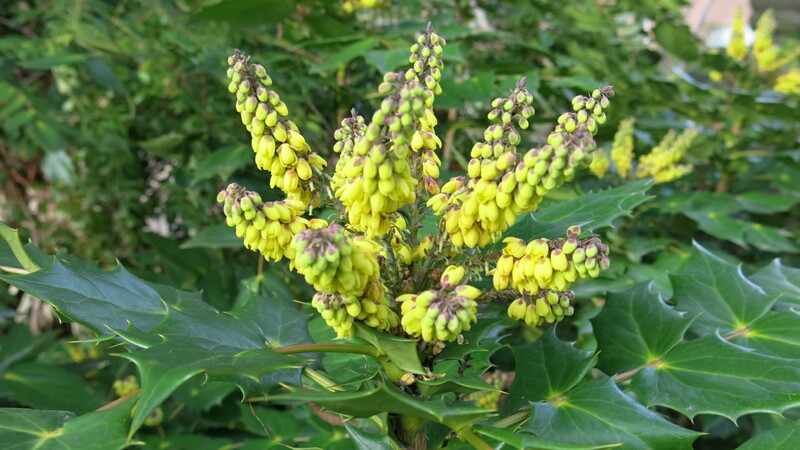 Mahonia bealei, leatherleaf mahonia, Zones 6-9. Sprays of yellow flowers occur in winter to early spring on this winter flowering evergreen shrub with spiny holly-like leaves followed by oblong blue berries that birds love. Fragrant, too! Rosmarinus officinalis, rosemary, Zones 6-8. 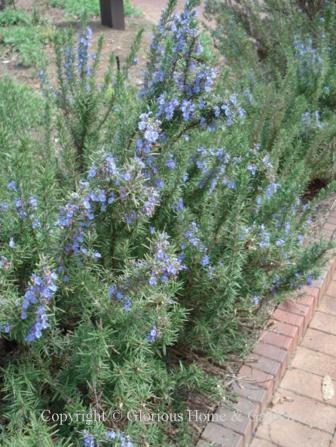 We don't often think of rosemary as a flowering shrub, but it has surprising flowers that adorn the plant in winter. Some cultivars have deep to pale blue flowers, others have lilac or pink. Rosemary is charming to grow in the garden or in containers for the convenience of snipping off fresh sprigs of the aromatic leaves for cooking. Sarcococca confusa, sweetbox, Zones 6b-8. Similar to S. hookeriana, but said to be more fragrant, this evergreen would be a good choice for massing. The flowers are small and rather inconspicuous, but highly fragrant. Sarcococca hookeriana, sweetbox, Zones 6-8. Evergreen leaves with green stems make this a good choice for winter color for a border or ground cover. 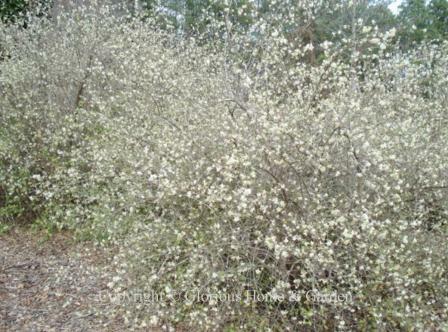 The fragrant flowers are tiny and hidden, but exude a lovely fragrance in late winter and early spring. Sycopsis sinensis, Chinese fig hazel, Zones 7-9. A member of the witchhazel family, the Chinese fig hazel is a winter flowering evergreen shrub that produces small yellow flowers in winter with predominate reddish stamens. A good choice for warmer climates. Viburnum tinus, laurustinus, Zones 8-10. An evergreen species with pink buds that open to white flowers in winter. 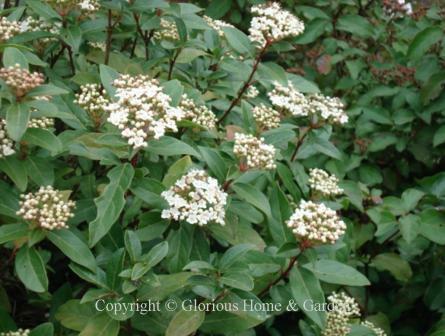 This winter flowering shrub makes an excellent hedge or screen in the warmer climate zones.